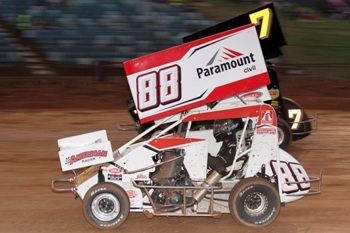 Bringing his time in Legend Cars to an end at the completion of the 2016-17 season, Philpott spent the following season on the sidelines, before making the decision to join the Formula 500 ranks, purchasing his NSW # 88 Paramount Civil supportedYamaha R6 powered Spike car, which is the first Formula 500 Spike car ever to be campaigned in Australia. Making his debut during last season’s ACT Title at Goulburn Speedway, the 37-year-old racer then put all his focus on studying the car during the off season, in order to come back bigger and better in what would be his first full season with the class. It’s this time in the shed that has made all the difference to Philpott’s 2018-19 season, with the rookie having exceeded even his own expectations, so far contesting two race meetings at Sydney’s Valvoline Raceway and coming away with a pair of impressive feature-race victories. 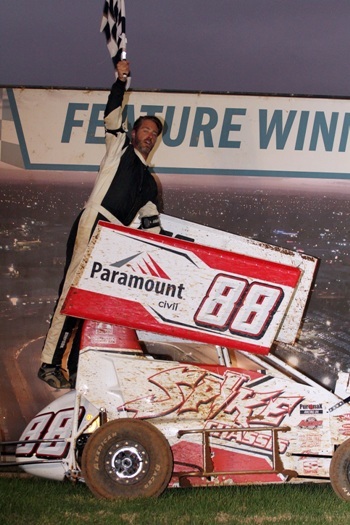 The most recent was last Saturday night, when he scored an impressive and hard-fought last-lap win. “We’ve been fairly surprised with how our first full season has panned out so far and we didn’t expect to be this competitivethis early on, but we know that it’s without a doubt due to all of the research and planning we put in over the off season,”explained theNarellan Vale, NSW resident, who also raced Speedway Karts prior to Legend Cars. “Not only are Formula 500s completely different to Legend Cars in terms of running a wing, but they’re also a lot faster, so I’ve had to adjust to these differences and I wanted to make sure I was as equipped as I could be before actually getting into the driver’s seat. In addition to contesting in the Valvoline Raceway and Goulburn Speedwayshows throughout the remainder of the season, Philpott plans to participate in the ACT Titleon March 2 and the Australian Title from April 18 to 20, both at Goulburn Speedway. He may also travel interstate to race in the latter stages of the season. Philpott would like to thank the following 2018-19 season sponsors for their support: Paramount Civil, American Tire & Racing Services, andVictory Race Cars. He would also like to give special thanks to his wife (Liza) and their two kids: Harper and Hudson. To find out more about Philpott, LIKE him on Facebook by searching 88Racing.